Before fully getting into today’s topic I feel the need to explain a little bit. Since the Mallrats lines, “Why don't they ever bring back or remake good shows, like BJ and the Bear. Now there's a concept I can't get enough of, a man and his monkey.” I feel like the show has become a one note joke. I honestly love the show. I picked up a horrible quality bootleg years ago and have watched every grainy episode. It’s pure 80's cheese in every way, shape, and form. Again this is said in a non-ironic way, even the theme song makes me happy. While I had a toy of BJ’s semi when I was a kid, I have no idea what ever happened to my toy cars after I grew up. 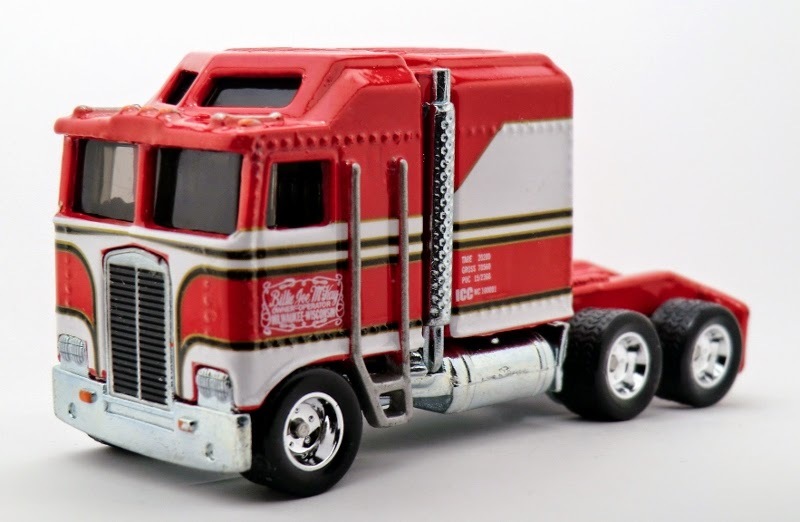 I wanted that big red rig to sit on my shelf though, so I kept an open search on eBay. I’m not the only one out there for a soft spot for Greg Evigan, those toys were expensive. Expensive enough that I never pulled the trigger and ordered one. I hadn’t been on ebay for a couple months so when I returned last week I was amazed at all the red trucks on my search page. I don’t pay attention to the toy car market. I had a worker at Toys R Us tell me that the local action figure collectors had nothing on their toy car guys. Just like anything else, there is apparently a huge obsessive market. So I missed that Hot Wheels had released a BJ and the Bear truck. I quickly checked the stores around me and came up completely empty. Instead of doing a circuit of stores every week I decided to just order the truck on eBay. There isn’t a whole lot to say about the toy itself. The paint job is accurate to the show. Under the driver’s window it even has the Billy Joe McKay scripting. The packaging is basic, clean, and has a bit of a retro feel to it. The only thing that may be confusing is it is sold as a Thunder Roller. The Thunder Roller is just the name of Hot Wheels’ Kenworth K-100 cab over semi truck. It’s a model they’ve been using since 1983 and has multiple different color variations. If you’re a fan of truckers with a heart of gold you should track one down. I’m going to go dig out my bootlegs.